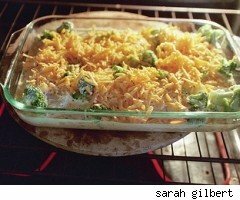 Check Temperature - "If you're wondering why your oven-baked culinary masterpieces don't come out right every time, don't blame the chef, blame the oven!" says Chris Hall, president of RepairClinic.com. "All too often, home chefs will find out that their oven is not reaching and maintaining the temperature they've set, which means their recipes simply won't turn out right." If you suspect your oven is not keeping the right temperature, first verify that the oven's built-in thermostat is working properly. This is easily accomplished with a separate oven thermometer. Set the oven temperature and then compare the temperature of the thermometer. To get an accurate reading, let the oven cycle on and off at least three times, which takes at least 20 minutes. Inspect Gaskets - The oven door has a gasket to keep heat inside the oven. Over time, these gaskets can become torn or deformed and this will allow heat to escape. Inspect gaskets to ensure they are in good condition and replace them as necessary. Help Hinges - If an oven door does not close properly, heat can escape. Make sure the door closes tightly and evenly. If it doesn't, check for broken or bent door hinges or door springs, which should be replaced. Test Timer - There's a tricky timer issue that has confused even the best of cooks. Many mechanical clocks and timers on ovens (those without digital LED displays) have a setting called "cook and hold." If the clock is accidentally set to this position, the oven may not work at all until it is set back to normal. Consult the instruction manual to set the clock or timer correctly. Don't Clean - If your oven is self-cleaning and you run the cycle the night before your festivities, you might find your oven has self-destructed. The self-cleaning cycle puts an oven though major stress. If it's going to break down, it'll happen then, and probably at the exact moment you planned to bake the holiday bird. Better to skip cleaning the oven or to do so a few days before you really need it so repairs can be made. Tom Kraeutler is the Home Improvement Editor for AOL and co-author of My Home, My Money Pit: Your Guide to Every Home Improvement Adventure. He delivers home improvement ideas and tips each week as host of The Money Pit, a nationally syndicated home improvement radio program.